Meade Instruments are world leaders in the design and manufacture of telescopes and accessories for amateur astronomers, but they also produce a select range of spotting scopes, microscopes and binoculars, for astronomy and for general terrestrial use. The company was first established in 1972 as a very small mail-order supplier of small refracting telescopes, but by 1977 Meade Instruments already started producing their own telescopes, the Meade Models 628 and 826 6" and 8" reflecting telescopes. Meade moved its Irvine based manufacturing to a brand new factory just over the border in Mexico in early 2008 where they now have over twice the space for production. In the past you could find many models including compacts and things like Meade digital binoculars or camera binoculars like the Meade CaptureView Binocular, which combined a camera and a pair of binoculars in one instrument. Their latest lineup consists of far fewer binoculars and they seem to be focusing on a more serious binocular which I personally think this is a good thing. I say this because in the past, the Meade Camera binoculars for example were little more than a gimmick (for more see my article on Digital Camera Binoculars) and this in my view cheapened their brand. 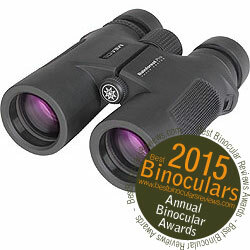 With their new Rainforest Pro series as well as their Glacier and the Astro binoculars, it becomes obvious that their focus is on a good quality pair of optics at an affordable price. 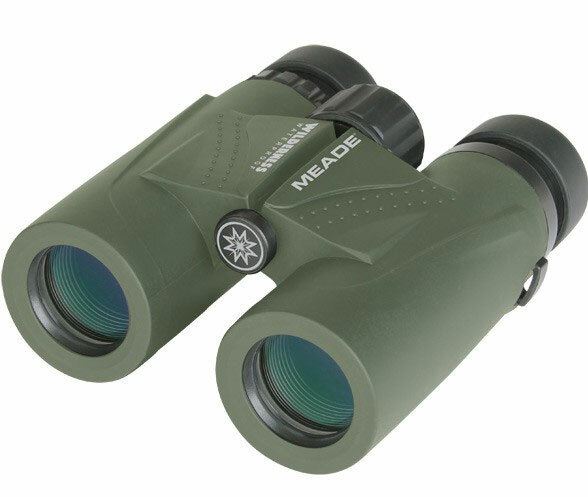 This goal is emphasized in their marketing as they often mention that you can get a pair of Mead binoculars that rivals the most expensive European brands and at a fraction of the cost. At the time of writing, I am still a little unsure if they still produce any Meade TravelView binoculars or not. Mead's newest series, the Rainforest Pro is also their top of the line offering. There are four models, arranged into two sizes, the mid-sized 8x32 and 10x32's and the full sized 8x42 and 10x42 Rainforest Pros. The cheap / low cost Wilderness range from Meade Instruments comes with most of the main features and components that you would expect to see at this price level. In my review of the 10x32 Wilderness, a highlight for me was their look, feel and build quality which are far beyond what you often see at this level and makes them look far more expensive than what they actually are. There are currently 6 models within the Wilderness range, arranged into three sizes, the compact 8x25 and 10x25, the mid-sized 8x32 and 10x32's and the full sized 8x42 and 10x42's. Whilst the giant 9x63 Meade Astro binocular with it's very large 63mm objective lenses is obviously designed to be used as a pair of Binoculars for Astronomy, their fairly modest magnification of 9x means that they can also be used by those looking for a binocular that produces exceptionally bright images and is therefore ideal for terrestrial use in low and poor light conditions. According to Meade the 63mm objectives provide almost 60% greater light gathering ability than the more commonly found 50mm models. 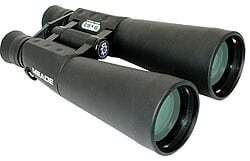 These binoculars have a field of view 305' at 1,000 yards, a 7mm exit pupil, and generous 21.5mm eye relief. As you would expect with a giant binocular they are on the heavy side, weighting 44 ounces, but also as you would expect with any astronomy binocular, they are tripod mountable (tripod and tripod adapter bracket not included). The Meade 9x63 Astronomy Binocular comes with multi-coated achromatic objective lenses provide and also included is a carry case, neck strap, lens caps and lens cleaning cloth. Field of view: 305 ft. at 1000 yds. 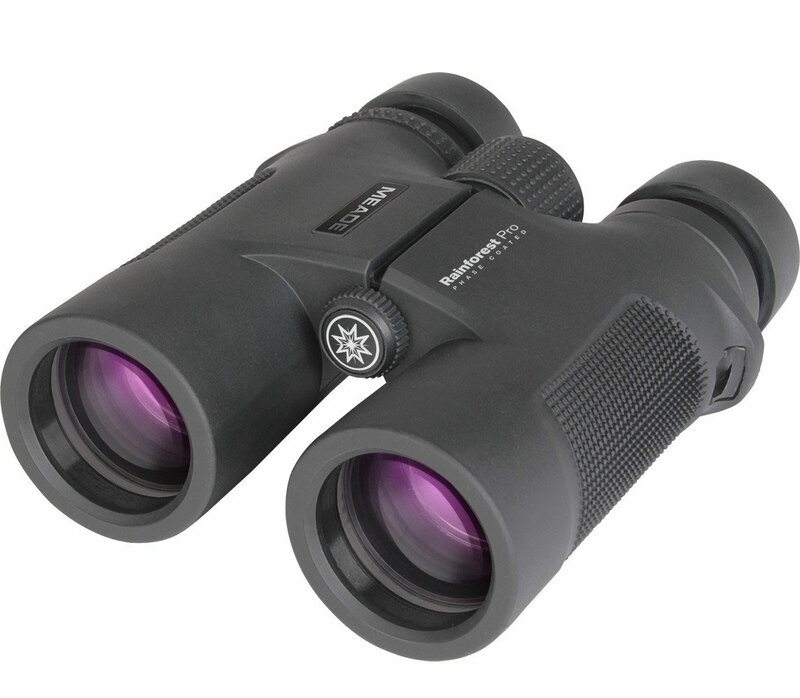 The 8x42 Meade Glacier binocular is interesting in that they have many quality features including fully multi-coated lenses and phase-coated roof prisms, yet are priced in the low cost range - you can find them for between $99 and $130 which is excellent. Phase correction coatings on the prisms help keep the light in correct color phases and therefore increase the image quality and contrast are mostly only found on far more expensive optics. The quality does not stop there as the Meade Glacier's roof prisms are made of BAK-4 (barium crown) glass, which again is a higher quality glass that also increases brightness and sharpness in images. 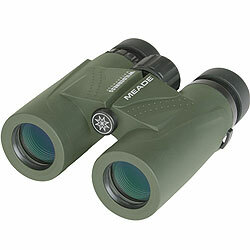 They produce a field of view that is 341ft wide at 1,000 yards and have a minimum close focusing distance of 6 feet and come with a comfortable 19.5mm eye relief that easily makes it onto my list of Long Eye Relief Binoculars and therefore will be more than enough should you wear glasses. 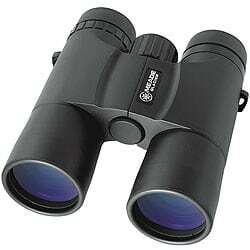 The binoculars are waterproof and come with lens caps, neck strap, carry case, and lens cleaning cloth.